In my early days of cooking, I had a friend from California who introduced me to what she called Texas Enchiladas. Instead of the usual filled and rolled enchiladas, the tortillas were fried, dipped in sauce, sandwiched with filling and then stacked in layers. I have not been able to discover the exact origin of this version of enchiladas, but I think they are popular in Northern Mexico, west Texas and in New Mexico. The post Gut Health 101 appeared first on Eating Bird Food. A big part of learning to cook in my twenties came down to radishes. This was largely due to the fact that I could hit up the farmers market and buy a bunch of fresh radishes for a dollar. I would use up the whole bunch: the radishes themselves would be my go-to veggie for a number of easy meals, while the tops would be added to salad greens, bowls of ramen, or sautéed with garlic. While the pungent, spicy flavor of radishes is always welcome in my salads and salsas, or even simply paired with bread and butter, I’ve found that roasting transformed them into an entirely different vegetable. Roasted radishes lose much of their peppery bite and toothsome crunch. They become mouthwateringly juicy and surprisingly sweet, while maintaining a slight kick at the end. Add a pinch of salt and some pepper, and you have a beautiful light lunch right there with a glass of Chardonnay. This roasted radish salad is a dish I trot out all spring. I find that feta is the perfect counterpoint to the sweetness of the roasted radishes, while chopped parsley and tarragon add a green verve in both flavor and appearance. Due to its easy preparation and bold flavors, this salad is my workhorse side dish: it’s appealing for potlucks, pairs well with steak for date night, and works on its own as a light lunch. Plus, the dish opens people’s eyes to the novelty of roasted radishes. In fact, I don’t think I’ve ever served this to someone who didn’t eventually make it themselves! Don’t throw away your radish greens! They have a peppery bite and are fantastic quickly sautéed with olive oil and salt, or turned into pesto. They’re also great in salads when mixed with other greens. 1 Roast the radishes: Preheat the oven to 400°F. Trim the tops and tails from the radishes (reserve the greens for another use), and cut the the radishes into halves (or quarters if your radishes are exceptionally large). Toss the radishes with the olive oil, salt, and pepper. Place in a large baking dish and roast for 20 to 25 minutes. 2 Prepare the vinaigrette: While the radishes are roasting, make the vinaigrette by placing all of the ingredients together in bowl and whisking them together. Taste and add more salt or pepper if needed. Set aside. Note: This vinaigrette makes more than you’ll need for the salad. It will keep in the fridge for a few days. Just bring it to room temperature and whisk back together before serving. Combine the roasted radishes and crumbled feta in a salad bowl, and toss with a tablespoon or two of the vinaigrette. Taste and toss with additional dressing as needed. Scatter the herbs over the salad and toss to combine. If your radishes are still warm, the herbs will wilt; this is fine. Serve warm or room temperature. Leftovers will keep for a few days in the fridge. Hello! All photos and content are copyright protected. Please do not use our photos without prior written permission. If you wish to republish this recipe, please rewrite the recipe in your own unique words and link back to Roasted Radish and Feta Salad on Simply Recipes. Thank you! In the past decade, recipes for Korean fried chicken have become a fixture on American menus. Nearly every Korean chef, from David Chang to Judy Joo, has his or her own fantastic version. Seattle chef Rachel Yang serves hers with a spicy peanut brittle; mŏkbar’s Esther Choi has a special-ordered whole fried chicken that is served stuffed with jujubes and rice. Deuki Hong continues to extend his love of fried chicken beyond his Sunday Bird take-out counter in San Franciso; he has another counter inside an H-Mart in Austin, Texas. Whether presented especially by a chef or taken to-go, it’s abundantly clear the love of this crowdpleaser runs deep and country-wide. 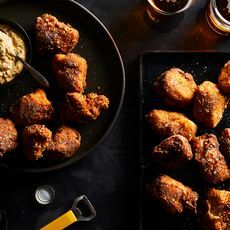 So when it came time for me to approach making my own fried chicken recipe, I immediately thought of chicken nuggets. Most of us probably have sentimental place in our hearts for a hot, processed chicken nugget dipped in a big playground of sauces, right? I figure that’s why, whether I’m teaching a cooking class to children or catering food for an event attended by adults, my chicken nuggets are the first to disappear. After experimenting with a few ways to make nuggets, I nailed down two tips for success. One: Since chicken breast is lean and can be notoriously dry and flavorless, the key is to bathe the chicken pieces overnight in a mix of mustard, pickle juice, and olive oil. This makes all the difference when it comes to tenderizing the meat. Two: Create a crust that makes the chicken taste just as good cold as it does hot. I took my mother’s light coating of rice flour and salt, but gave it my personal touch by adding rolled oats blitzed with a savory blend of spices. For a spicy coating, I add gochugaru (Korean hot pepper flakes) and cayenne. As for the sauce, I wanted for it to stand its own, something even my picky father would try. It ended up unconsciously becoming my ode to a childhood love of sautéed Napa cabbage kimchi, paired with a fresh-made ranch dressing that I want to smother on everything but the kitchen sink. Because this recipe brings Korean and American flavors to the table exactly as I crave them, I’m calling it my own mark on the Korean fried chicken landscape. 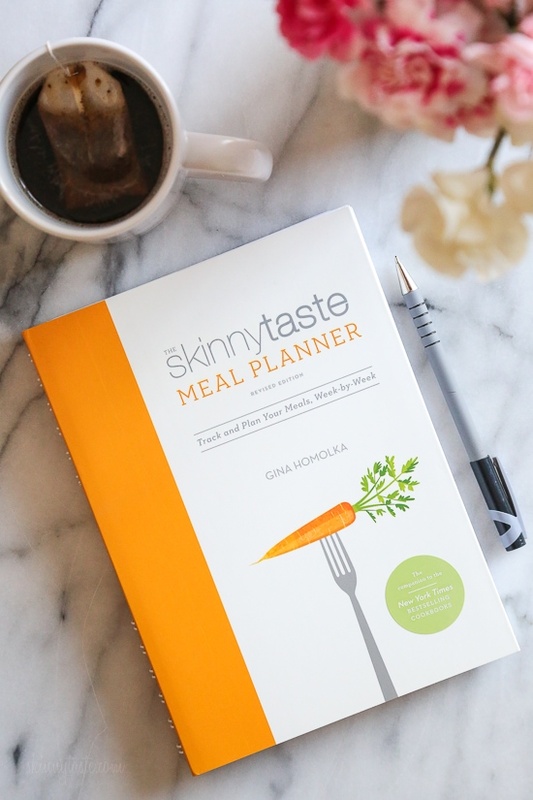 Good news for those of you asking, The Skinnytaste Meal Planner is back in stock. There was a misprint on the previous so we had to go back to the printer. It should be all fixed now! *Green salad (per serving) includes: 2 cups romaine, ¼ cup each: carrots, tomatoes, cucumber, chickpeas, ½ a scallion and 2 tablespoons sliced almonds. 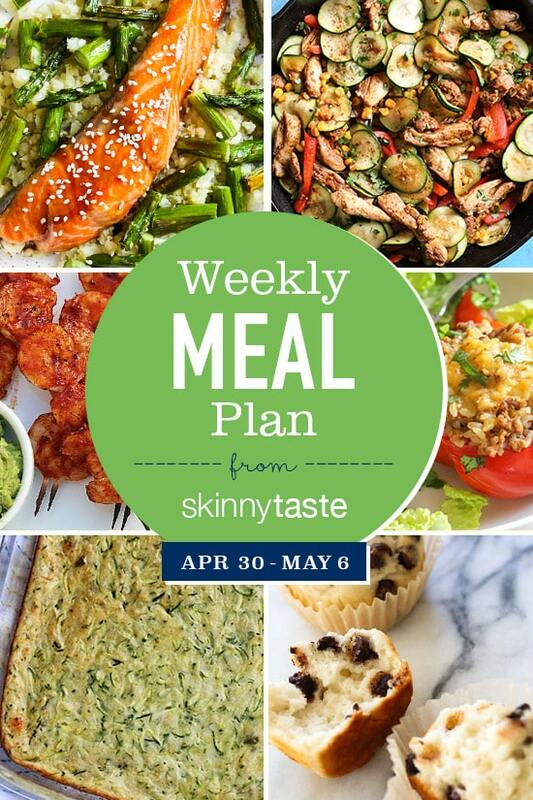 This month, Megan Gordon is back with us sharing her weekly meal plans! Megan is a writer and recipe developer living in Seattle, WA, the author of Whole Grain Mornings, and mom to a 2-year-old. Please welcome Megan! May, I thought you’d never come! While I’m not naive enough to think that we’ll magically start seeing warmer temperatures in Seattle anytime soon, it’s nice to see the flowers in bloom and the longer days always inspire slightly more leisurely cooking in the evenings. 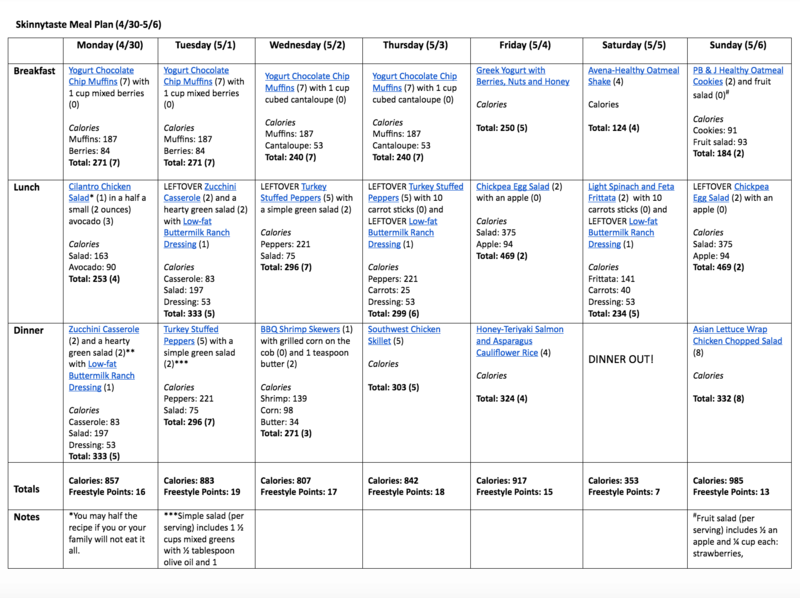 We just got home from a family trip to Hawaii, which was great in so many ways, but I always struggle a bit in thinking through how to eat well and feed our toddler healthfully when we’re not in our home kitchen. We definitely ate out a great deal, and didn’t have much control over the menu (our son couldn’t have been more pleased with the frequency of French fries). Don't throw away those carrot tops! Make this delicious carrot top pesto with them to toss with pasta, beans, or eat straight up as a dip. While carrots are available all year round, the best season for carrots is in the spring, and in the spring you can often find carrots with their feathery green tops still attached. If you happen to buy carrots with carrot tops, I urge you to think twice before throwing the carrot tops away! You’ve paid for them, and if they are still fresh and green, you may as well use them, right? Carrots are in the same family (apiaceae) as parsnips, coriander, fennel, and parsley. Not surprisingly the carrot greens taste a lot like parsley! A little bitter, a little carrot-y. Greens from younger carrots are milder than those from older carrots. Carrot tops are high in vitamin C, vitamin K, and potassium. Use them as you would parsley, or in place of parsley in recipes. Strip the leaves from the tough stems, add them to stock or soup, put them in salads, or make chimichurri. Or make this carrot top pesto. I promise you this pesto will change your mind forever about carrot greens. Since carrot tops are slightly on the bitter side (like parsley), we are using equal amounts of baby spinach and tops for this pesto. You could also swap out some of the greens in other pesto recipes with carrot tops. How to use carrot top pesto? Like any other pesto. Mix it with pasta, serve it as a dip, add it to baked smashed potatoes, toss it with white beans, or go all in with carrots and serve it as a spread over roasted baby carrots. 1 Prep the carrot tops: Rinse the carrot top greens to dislodge any dirt. Pick out and discard any dry, yellowed, or otherwise unappetizing looking leaves. Discard tough stems. 2 Pulse greens, garlic, cashews, salt, pepper in food processor: Place the carrot tops greens, baby spinach, chopped garlic, roasted cashews, salt, and pepper in a food processor. Pulse several times. Scrape the sides down with a rubber spatula. 3 Slowly add the olive oil: While the food processor is running, slowly pour in the olive oil in a steady stream. Scrape the sides down with a rubber spatula. Pulse until smooth. Hello! All photos and content are copyright protected. Please do not use our photos without prior written permission. If you wish to republish this recipe, please rewrite the recipe in your own unique words and link back to Carrot Top Pesto on Simply Recipes. Thank you! 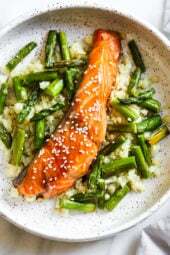 Baked Honey-Teriyaki Salmon and Asparagus with Cauliflower Rice, this 15-minute dinner is not just tasty, it’s also good for you! Salmon is my go-to fish, are fantastic sources of DHA, the omega-3 fatty acid that is essential for brain development. 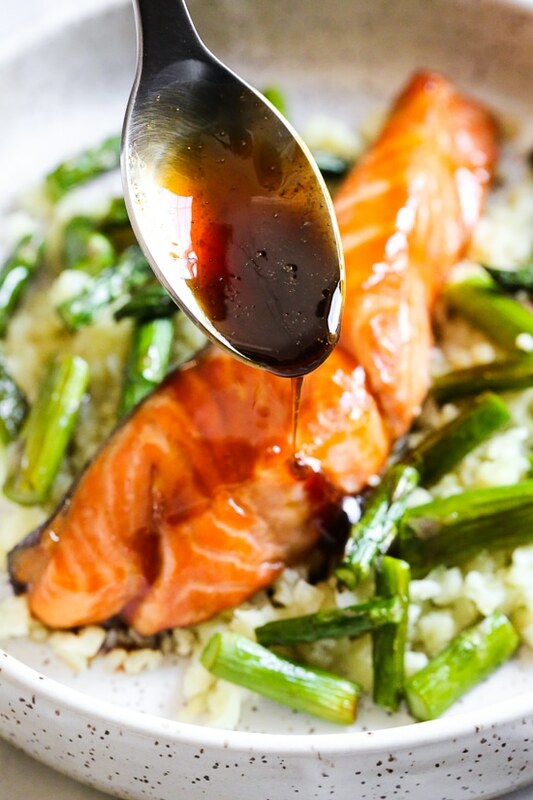 I rotate through all my salmon recipes, some of my favorites are Maple Soy Glazed Salmon, Healthy Salmon Quinoa Burgers, Seattle Asian Salmon Bowls, and Gochujang Glazed Salmon, just to name a few! I prefer wild salmon over farmed, preferably Alaskan and usually get disappointed when I order out because I know I can make it better. The reasons, they usually overcook it and many restaurants don’t have wild salmon as an option, which makes all the difference in quality, taste and the health benefits. You can marinate this for 10 minutes, or as long as 8 hours. 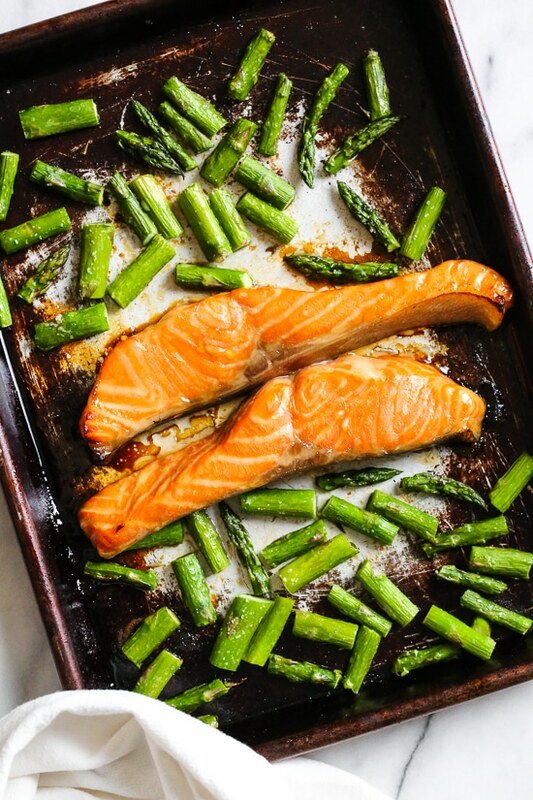 If using frozen salmon, thaw in the refrigerator the night before. Always buy salmon from your trusted fishmonger. If the fish is previously frozen, it’s best to buy it fresh and that yourself. Combine the soy sauce, mirin, sake, and honey in a resealable bag. Add the salmon and mix to coat. Refrigerate for 15 t0 60 minutes, or up to 8 hours. 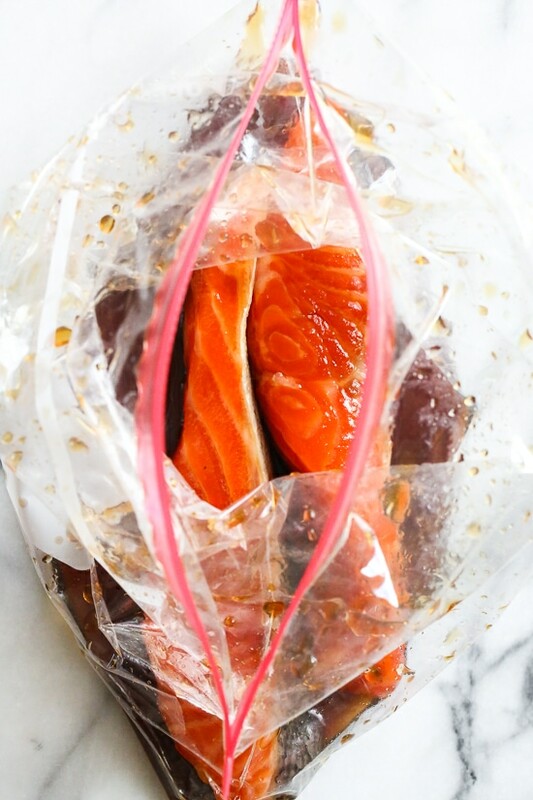 Remove salmon, reserving the marinade. Toss asparagus with oil and season with salt. 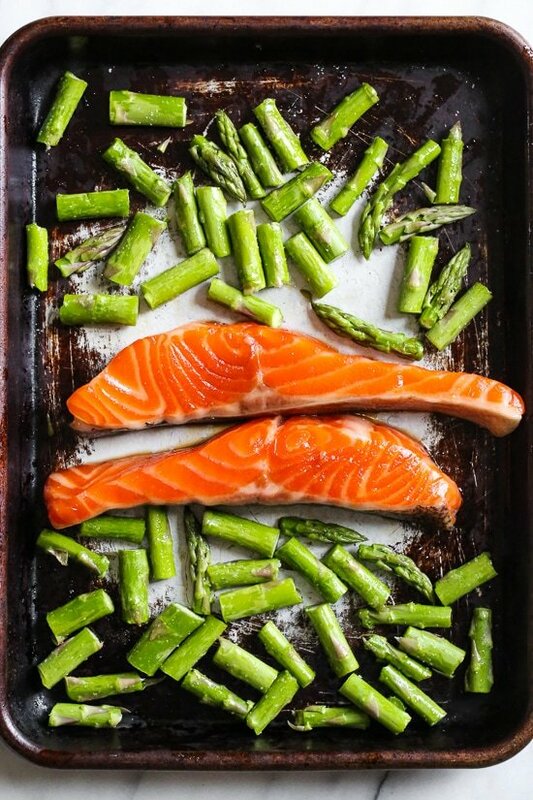 Transfer asparagus to a large sheet pan along with the salmon skin side down and cook until tender and cooked through, about 10 to 12 minutes. Meanwhile, place the marinade in a small pot and simmer on low until thickened and reduced by half, about 8 to 10 minutes. Spray a large skillet with oil. Cook the cauliflower rice in a skillet over medoim-high heat until tender, 4 to 6 minutes. To serve, divide the cauliflower rice, top with salmon and asparagus and drizzle with the glaze. Sprinkle with sesame seeds, if desired.